Many forget that they need to constantly be thinking about their retirement if they hope to be able to actually retire the way they want to. A simple retirement planner spreadsheet can do a lot of good towards getting them to their eventual goals. The retirement worksheet can be downloaded instantly at absolutely no charge on this page. 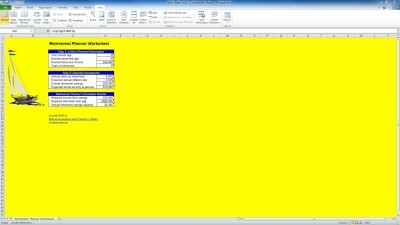 The simple retirement planner spreadsheet is a Microsoft Excel program that allows you to project into the future the type of savings you will need to do in order to get to the point where they want to be. In other words, it is a spreadsheet that will help you to make the decisions you need to make in the present to impact your future. The first section of the planner is titled “Collect Personal Information.” The first step in filling out the Excel retirement planner is to add your current age followed by your desired retirement age. Next, add your desired retirement income followed by how many years you plan on being retired. The next section is titled “Describe Investments.” Here is where you will input the annual return on investment, the expected annual inflation rate, your current retirement savings amount and your expected social security and pension amount. The final section in the simple retirement planner spreadsheet is titled “Retirement Planner Calculation Results.” This section will reveal financial figures based on the numbers you placed in the first two sections. Here, who will see what your required income from savings, the amount required for a retirement nest egg and how much annual retirement savings will be required. While many believe the best part about this Excel simple retirement planner worksheet is that it’s absolutely free, it also includes step-by-step directions. The worksheet is perfect for anyone currently in the workforce, no matter your age, income, location or walk of life. Download the simple retirement planner spreadsheet today and take the first step towards a stable financial future.